We recently made homemade English toffee as an activity to accompany reading The Magician’s Nephew. This is an easy recipe for toffee. Although you have to use a candy thermometer and that seems to automatically make me think of difficult. But it’s not. Really. Trust me, I avoid doing hard things in the kitchen when at all possible. I based this recipe on one I found from Ghirardelli combined with a couple ideas from this recipe and really liked the results. I should disclose that I have no idea if this really is indeed authentic English toffee. But it worked for us. 🙂 As a bonus, it’s naturally gluten free. Can I get an Hallelujah from all the gluten free mommies out there?! 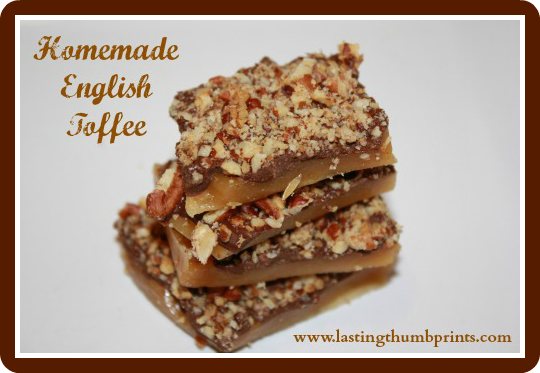 Easy and delicious recipe for English toffee. Preheat oven to 350 degrees. Spread chopped pecans on cookie sheet and lightly toast. Line small baking sheet or pan with aluminum foil making sure there is at least ½ inch "wall" on the sides. Combine first four ingredients in heavy saucepan over medium heat stirring occasionally. Allow mixture to come to a boil and reach 305 degrees. When mixture reaches 305 degrees, remove from heat and stir in vanilla. Pour mixture into prepared baking sheet. Sprinkle chocolate chips over top of mixture and allow to sit for 2 minutes. Once softened, spread chocolate in even layer. Sprinkle nuts over mixture and gently press into chocolate. Break toffee into pieces and store in airtight container. The next time I make this I will press the pecans in a bit more than I did because they fell off more than I would have liked. I’m also not a big fan of semi-sweet chocolate – well, chocolate in general – but the chocolate was not too bitter for my tastes. The toffee had a really nice balance in the flavors. If you try this recipe, I’d love to hear what you think! Love this recipe! 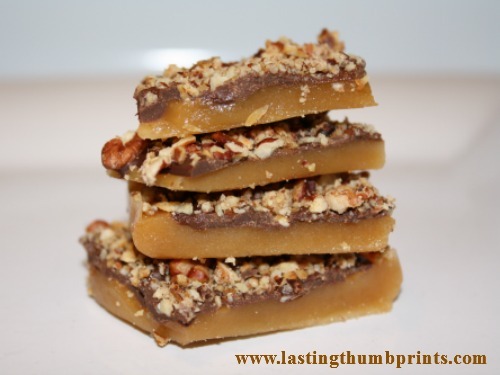 The best toffee recipe I have tried. So delicious. Thanks for sharing this recipe. Love it! So delicious and easy to make. My toffee never turned brown. What am I doing wrong? Did you boil until it reached 305 degrees? That’s the key to the right color and texture. I made this tonight, and it turned out perfect! I did almost burn it ( I don’t have a heavy pan that the candy thermometer will hang right on the side). But it doesn’t taste burnt, and the crunchy texture was perfect! Thanks for the recipe!